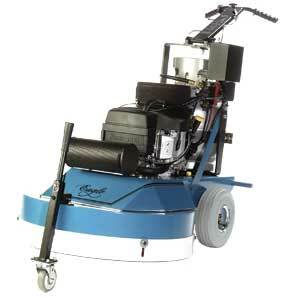 Eagle Tracker 3000 high production strip machine strips or scrubs in a 30″ path with two 16″ counter rotating brushes removing multiple layers of floor finish easily with its propane powered engine. No need for high voltage electric cords. Run time is 5 to 6 hours per propane cylinder. Available with your choice of Kawasaki or Robin engines. Emissions protected by 3-way catalytic muffler on Kawasaki and Robin engines. Comes standard with Kill Switch and Emissions Shut Down System. Optional 16″ pad drivers available. 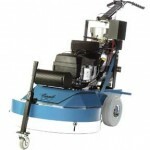 All machines come standard with service alert (hour) meter, two gear driven Strata Grit Plus 16″ stripping brushes, easy change brush to pad drivers, transport wheel, adjustable handle, aluminium safety fill fuel cylinder with overfill prevention device (OPD) UL and DOT approved and two year warranty. Are you looking for “Floor Stripping and polishing Services?” Contact us! This entry was posted in Superior Products. Bookmark the permalink.